"Litharacnium" by Dennis and Margo Proksa is located at S. 8th snd W. Broad streets. Photo courtesy Boise City Department of Arts and History. When you think of public art, the first image that pops up is often some amorphous blob surrounded by concrete—what author Tom Wolfe referred to as the “turd in the plaza” school of art. But Boise wants its public art to be different by taking into consideration the location and context. Altogether, Boise has 761 artworks in city-owned collections and 325 site-based public art installations. Like many cities, Boise devotes a percentage of coffers each year to showcasing public art, explained Karl LeClair, now in his third year as public art program manager for the city of Boise. Since 1997, Boise has awarded $1.275 million among 421 grants. The airport, public works, and urban renewal agency also have public arts funds and projects. But unlike many cities, Boise devotes money to maintaining its art as well. Of the hard costs of the city’s annual capital construction projects, 1.4 percent is devoted to public art: 1 percent to building it and 0.4 percent to maintaining it. “A lot of programs just develop the ordinance, run off and fund works, and are now grappling with the problem of an aging collection,” he said. 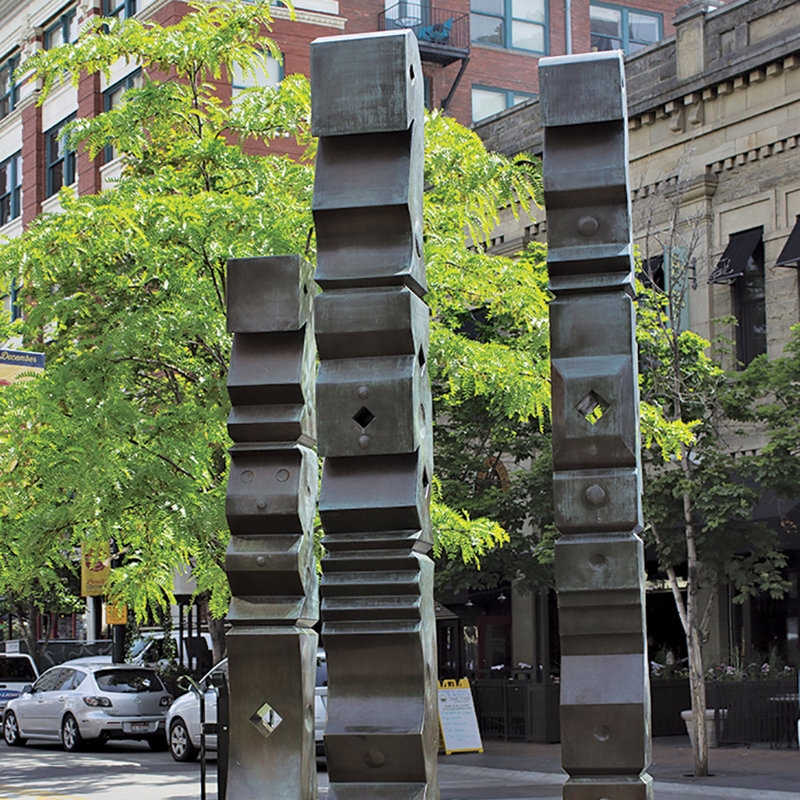 “Boise Totems” by Rod Kagan at W. Idaho and N. 8th streets. Photo courtesy Boise City Department of Arts and History. Boise also makes it easy to work with artists, according to Ward Hooper, who is known for his iconic Idaho posters. His Boise public art projects include the two flags that anchor each side of the Basque Block, as well as some historic pieces in front of the former Blues Bouquet on Main Street and the small plaques that adorn Boise’s geothermal public buildings. One of Boise’s most popular public arts projects is “box wrapping,” for which it hires artists to develop posters that wrap around utility boxes. Boise is adding 30 wraps: 27 new ones and three to replace ones from the early days of the project that have deteriorated. “They have a five-year lifespan, and some are in pretty good condition at the 10-year mark,” LeClair said. And, sadly, sometimes public art does have to go away, or be “deaccessioned,” LeClair remarked. “Deaccession is something that must be dealt with when managing a collection.” For example, Boise recently had to deaccession a mosaic on a city street when frost and moisture cracked the subsurface and it couldn’t hold up to the traffic. “Surface wear and vehicles are not the best destinations for an artwork,” he said. “Bike Trio” by Michael Brown and David Cole at S. 14th Street. Photo courtesy Boise City Department of Arts and History. From there, the city develops a request for qualifications (RFQ) that asks artists for their resume, examples of past work, and what public art they’ve worked on. From that RFQ, three to five artists are put on contract and paid for the design phase. The artists then reach out to the stakeholder group and develop design concepts. The arts staff decides who to work with and gains approval from the Boise Arts and History Commission and the Boise City Council. Boise makes its public art easy to find. There’s a website at https://www.boiseartsandhistory.org/explore/map/#/search that lets you look in specific neighborhoods, for specific categories, or specific types of art. In addition, there’s a number of brochures, available from City Hall, that have maps and pictures of the top 10 or so public art pieces in each of the neighborhoods. The idea is to give people a taste and then drive them to the website for more information, LeClair said.